By Lisa M. Anderson. Chicago: University of Illinois Press, November 2008. Cloth: ISBN 9780252032288, $35.00. 142 pages. 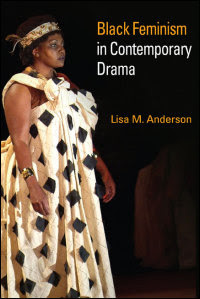 In Black Feminism in Contemporary Drama, Lisa Anderson gives a history of black feminism in the United States from the nineteenth to the twenty-first centuries and what role black feminism plays in the lives of women today. Anderson, an associate professor in women’s studies and theatre at Arizona State University, looks at the position of theorists, artists, and black feminist aesthetic to critique fourteen plays by black playwrights. Few books explore the development and principles of black women's plays and feminism; therefore, both academicians and thespians will find Anderson’s book valuable. Black female playwrights’ work is for the most part hidden from mainstream attention, and the critique of black feminist theatrical dramas is almost nonexistent (13). How does one critique black feminist drama? Anderson explains that she examined each play by how they bring to light histories that have remained buried in dominant society. Such burials hide the challenges to the lives of young women today. Anderson’s descriptors and dissection of the characters in each of the plays allows the reader to truly visualize the image of black women’s pains, joys, hurdles, and triumphs throughout the history of the U.S. Anderson shows that black feminist dramas are not only instructing and entertaining viewers, but more importantly, provoking the audience to conscious action. Readers should be moved to consciously act on communicating awareness they’ve gained regarding the complex lives of African American women in American society, past and present. Students of theatre can benefit from the primary and secondary sources of the first, second, and third waves of feminist movements, which positioned women as speaking subjects in the theater as opposed to just submissive objects for visual consumption. Anderson’s concept of black feminist aesthetic involves the image of black women, the history of black women across the diaspora, violence against black women, homophobic fears and alienation, and other identities (14). Anderson investigates nine black female playwrights through the foundation of black feminist scholars and helps the reader understand how these playwrights all had a range of components that constitute black feminist drama. A few of these components are: confronting racist imaging of black men, abuses that black women suffer at the hands of all men of all races, the importance of reproductive freedom for black women, oral folk or oral culture, and the impact of institutional racism. Anderson does what few works of scholarship have attempted: she exposes the commonalities in plays that tackle black feminism and black nationalism. Anderson is very successful in showing how the plays were situated, constructed, shaped, and informative of the politics of black feminism. The playwrights Anderson selected represent different writing styles; this serves as a strong asset for the book. The major strength of this book is showing how black female identities can be and are reinvented to exclude negative stereotypes but still are impacted by race, class, and gender oppression. The first playwright examined is Pearl Cleage and three of her plays. The dramatic review of these plays all shared the obstacles that black women faced in the late 1880s, 1930s, and 1960s. The next playwrights are Breena Clarke and Glena Dickerson, for their play Re/Membering Aunt Jemima: A Menstrual Show. This play is examined as a parody of minstrel shows, commingling recent and contemporary contacts with historical ones (53). For example, the story of how plantation miscegenation during enslavement was political for the offspring, is commingled with the tragic life of mulatto actress Dorothy Dandridge, whose acting career was hampered by her neither “black enough” nor, because of her black blood, “white enough.” Most importantly, this play shows the complexity of womanhood, and how black women are dishonored, through the main character Aunt J (Aunt Jemima). Three plays by Suzan-Lori Park, a new up-and-coming artist, are explored: Death of the Last Black Man in the Whole Entire World, Venus: A Play, and In the Blood. Anderson gives a dramatic commentary on the victimization of women in each play. The chapter “Signifying Black Lesbians: Dramatic Speculations,” as its title indicates, counters the general tendency to keep the history of black lesbian and gay history buried. The last playwrights in this chapter, Kia Corthron and Shirley Holmes, self-identify as lesbians. Their plays tackle sexual orientation and acceptance/rejection within the black community. Anderson makes known how identification as a black lesbian is political, and black lesbians’ relationships are often challenged: they are often considered not truly black and at the same time not truly lesbian, because acceptance of such lifestyles is (questionably) viewed as a white, middle-class issue (98). This chapter may be for many an eye-opener, as it promotes understanding the history of black lesbian identity in the black community, which for the most part was invisible in black plays until the 1960s (97). The plays selected, overall, are a valuable addition to the field of black feminist theatrical criticism because they bring to readers’ attention the works of a number of overlooked black feminist playwrights and provide a language to recognize and discuss black feminist drama (126). I am intrigued by this review as it gives a descriptive account of African American women playwrights. Although I have very little knowledge of the thespian arts, I would like to read the book.